This morning we got up and went to captain cooks to grab some breakfast. We took out refillable mugs along and DH and I got a coffee each and DD had a Coke. 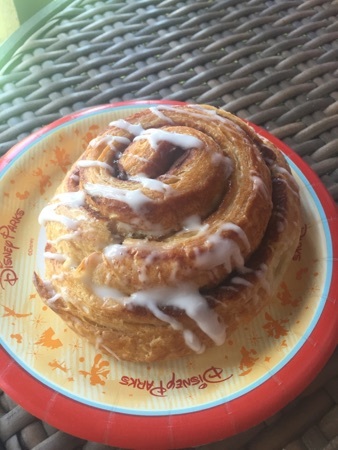 DH and I both used a snack credit on a cinnamon danish. These were a good size and enough for a breakfast snack with a cup of coffee. DD got a Minnie Mouse speciality cupcake. 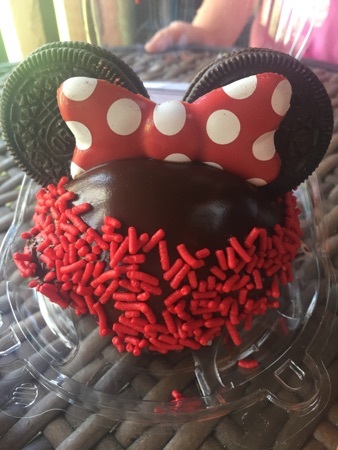 This was chocolate cake with chocolate mousse on top covered with chocolate and 2 Oreos for Minnie's ears and a chocolate bow to finish it off. This was absolutely delicious! These was the right proportion of cake to mousse. Each of these were a snack credit each, if we'd paid it should have cost us $15. After our breakfast we spent some time in the pool then headed to epcot for the afternoon. 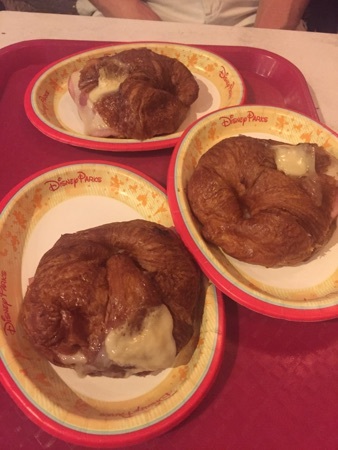 We walked round to patisserie boulangerie des halles in France and each got a ham and cheese croissant using a snack credit each. These are so good especially warm. They're just enough for a light lunch. These were $4.75 each. Mid afternoon we stopped off at the DVC members lounge in Epcot for abit of a sit down and some drinks. They have Coke freestyle machines you can help yourself to drinks and come round with a trolley of snacks like crisps and sweets. This evening we had dinner at the yachtsman steakhouse. We dined here last year and it was one of the best meals we had. It's quite a dark restaurant so photos tend to want a flash but look too bright with it. 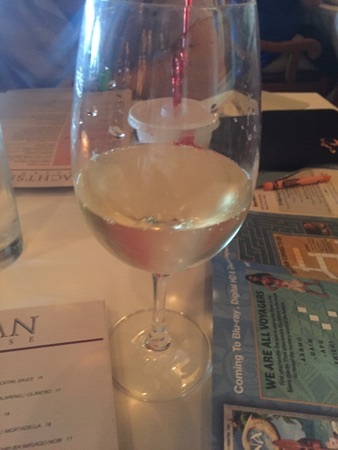 I ordered a glass of Pinot Gris, this was $11. DH had a glass of red and DD had an orange juice. 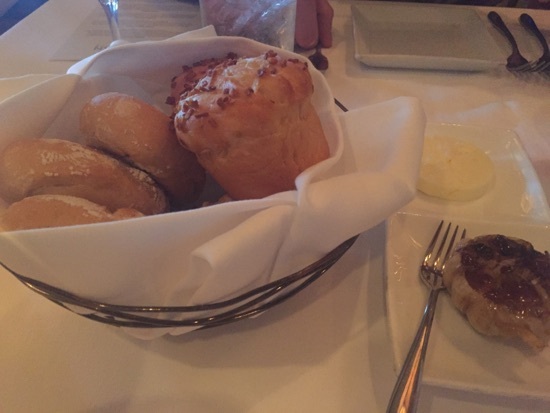 Our server brought us the bread service to start, this was an onion roll and a soda bread, served with sea salted butter and a bulb of roasted garlic. The garlic is so smooth and soft like butter and tastes amazing! For starters DH and I both ordered the artisanal cheeses, this was $18. 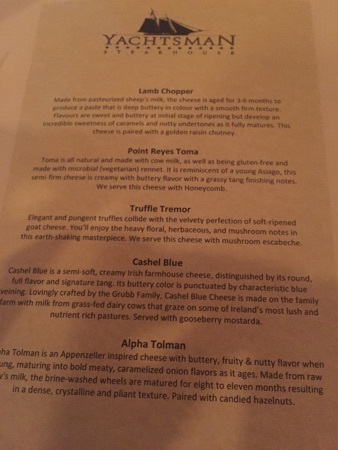 The 5 cheeses were each paired with an accompaniment. This was absolutely amazing. 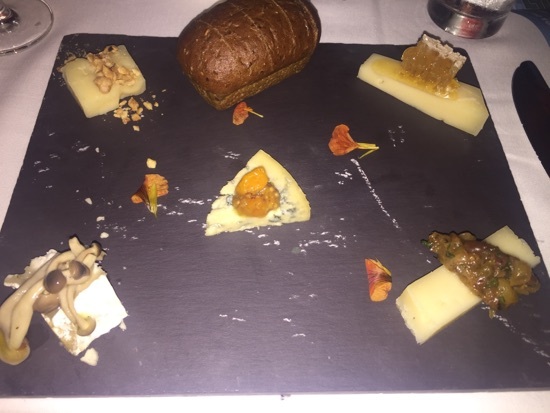 All 5 cheeses were delicious and the bread had a sweet honey taste to it. My favourite was by far the blue cheese in the middle, so creamy and salty. 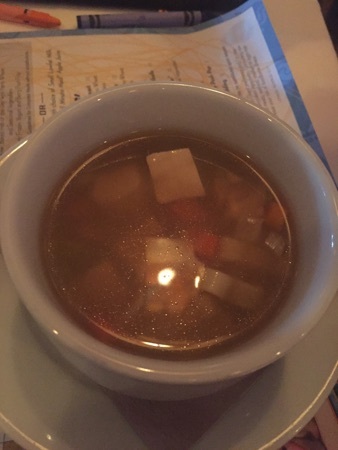 DD had the kids chicken noodle soup. She ate all of this and really enjoyed it. 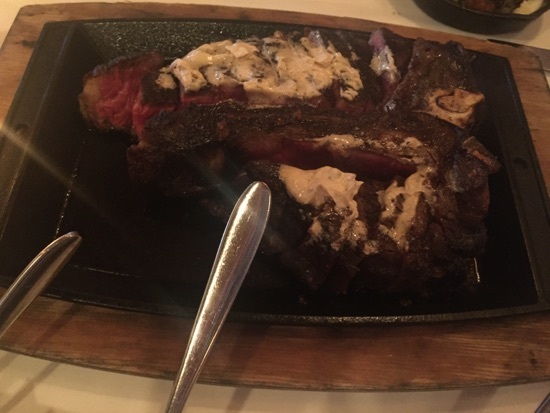 For our main DH and I shared the 32oz porterhouse. We had this cooked medium rare. It came with 3 steakhouse sides, these were mushrooms, creamy spinach and onions. It also came with crushed potatoes in a herb and butter dressing. This was really good! There was a lot more fat on the meat than last year but was cooked perfectly! 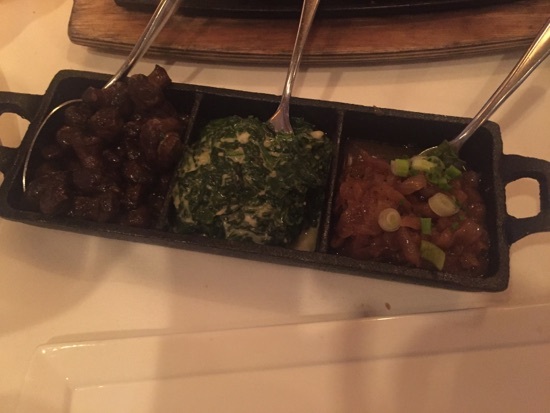 The mushrooms and spinach were particularly nice. 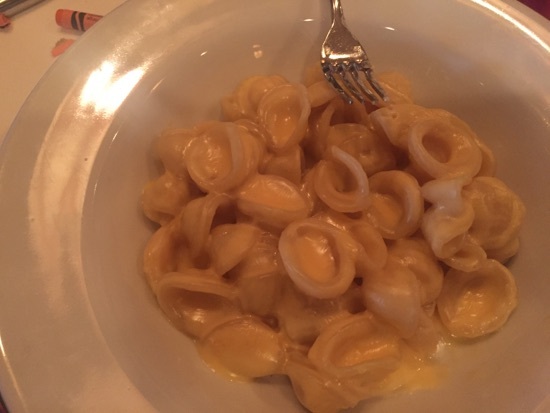 DD had the kids Mac and cheese. She didn't eat a lot of this after finishing all the soup but it was nice, really rich and creamy. For dessert I had the chocolate peanut cake. This was amazing! 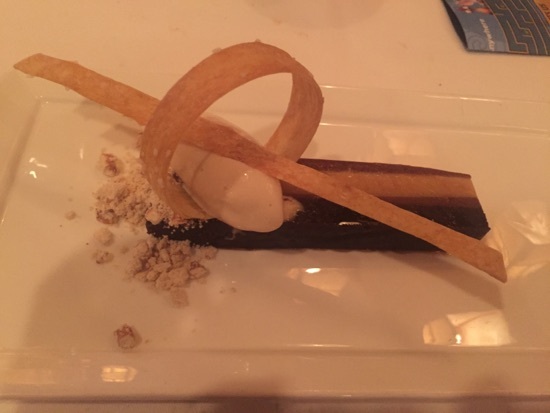 It was chocolate and peanut ganache topped with salted caramel ice cream and pretzel crumb with pretzel pieces. 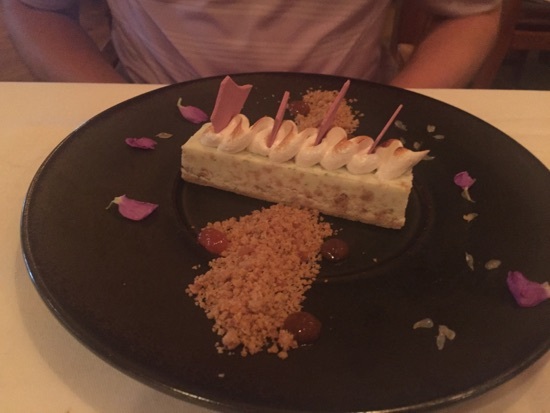 DH had the lime semifreddo. This was meringue, guava and berries. He really enjoyed this. DD had the Mickey puzzle. 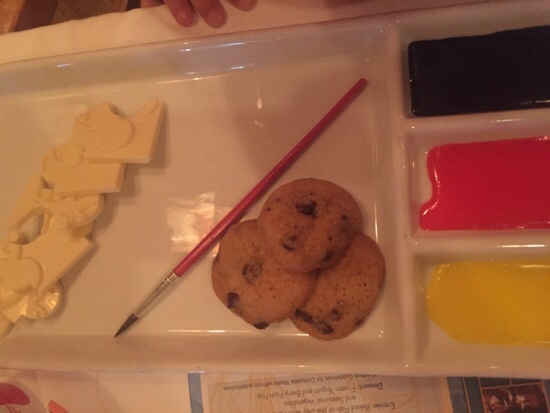 This is a white chocolate jigsaw with icing to paint it with and 3 chocolate chip cookies. She loved painting this and managed to eat about half. The bill should have come to $215 for our meal and $26 for our wine. We love the yachtsman and I would love to come back on our summer trip. The members lounge looks a lovely place to chill out. I do love a cinnamon danish - it looks lovely, as does the cupcake. New Photo Added by missdopey - 19 Apr 17 12:15 PM. Love the look of that Porterhouse but DH would not eat mushrooms or spinach. Can you substitute the sides? 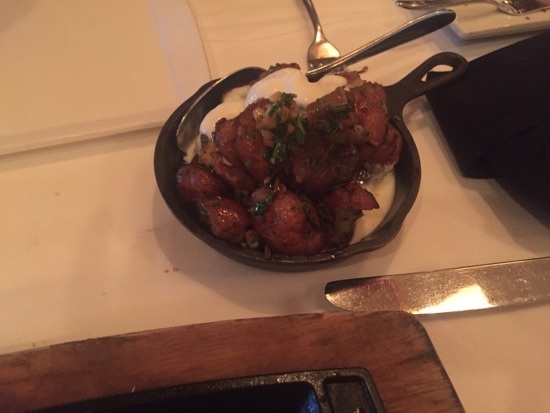 We didn't make it to yachtsman steakhouse this time, but I so wish we had - in fact, we wasted a meal at Chick fil A, and I really wish we had gone to yachtsman instead especially after seeing your lovely photos! Lots more good eats today, that croissant is firmly on my list!